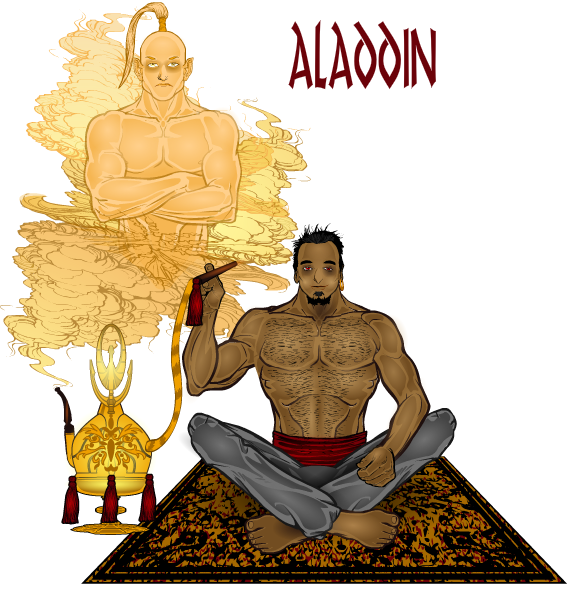 The winner of this weeks poll was djuby for his interpretation of Aladdin. Well done sir and well done to everyone who entered. Thanks for the votes folks. Shocked indeed. Great design, djuby! The hooka is amazing. What stands out are the expressions. While Aladdin is addled and content, the genie is angry and bitter. Most would interpret this as the genie upset that his lamp is being abused. I look at it as the way drugs affect certain people – myself included. Outside, you’re doped and grinning stupidly. Inside, you have awakened a resentful demon. Timedrop23’s BRIDE: Cool story and costume to match. tolkienhiste’s Alice in Wonderland: not necessarily a re-imagining, but excellent execution. Vectorman’s Blackbeard and Captain Blood: Blackbeard’s face and the outfits. Herr D’s Miss Cuttenclip: Another great dress and Herr D’s trademark sense of humor. @djuby: I noticed the same potential metaphors for drug use as AP, along with ‘letting it out,’ ‘living in a bottle,’ etc. Good work. @AP: Thanx. Energy can be interesting lace. I wish I could say that I had put that much thought into it. @djuby: gotta love an honest artist. I frequently have an extra laugh at literary critics even though I have some of the same skills.